Ball pits could contain life-threatening germs because they can go weeks without being cleaned, research has warned. Nine germs that can have disastrous outcomes, including septicaemia, meningitis and pneumonia, were identified in a study. 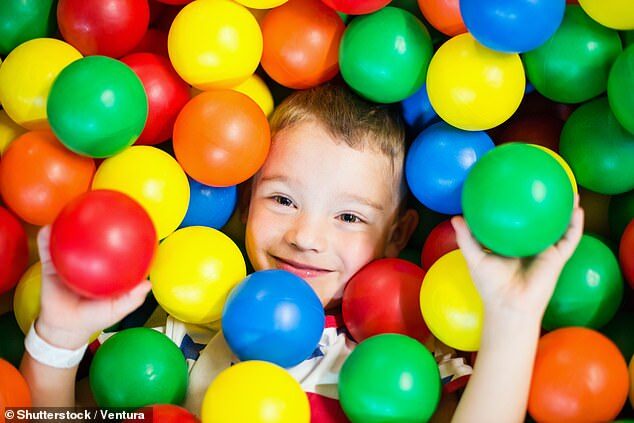 Ball pits that are often used by autistic children for therapy were investigated. There are no regulations on how often the play areas should be cleaned, researchers said, leading to a growing colonization of bacteria. ‘Ball pits are often contaminated with visible dirt, vomit, faeces, or urine providing an origin and permissive environmental factors for microbial contamination’, said study authors at the University of North Georgia. Swabs were taken from nine to 15 balls taken from various depths. On the plastic surfaces, 31 bacterial species were identified, including eight pathogenic bacteria and one pathogenic yeast. COULD YOUR DISHWASHER HAVE HARMFUL BACTERIA? Deadly bacteria could be lurking in your dishwasher, research from the University of Ljubljana, in Slovenia revealed. The kitchen staple can contain everything from E.coli, which causes life-threatening food poisoning, to other pathogens linked to infections of the urinary tract, skin and inner heart lining. Although usually harmless, these bacteria can be fatal in people with reduced immune systems, such as those undergoing chemotherapy or organ transplants. They also contain Pseudomonas, which can cause chest infections, and Acinetobacter, which is linked to infections of the urinary tract, skin and inner heart lining, which can be deadly. As well as bacteria, dishwashers also frequently contain fungi such as Candida, which causes thrush. Researchers recommend people reduce their risk of infection by allowing dishwashers to cool before opening them and wiping their rubber seal after every use. Although there are microbes in every environment, these bacteria, when given the opportunity to cause infection, can be fatal. A rough estimate was made of the bacteria’s prevalence, but in some cases, the numbers were in the thousands. The bacteria included Enterococcus faecalis, which can cause endocarditis, septicaemia, urinary tract infections, and meningitis. Staphylococcus hominis can cause bloodstream infections. Acinetobacter lwofii has been reported to cause septicaemia, pneumonia, meningitis, urinary tract, and skin infections. This risk of a child being infected by these bacteria increases if there are cuts to the skin, especially if their immune system is compromised. The authors said: ‘We found considerable variation in the number of microorganisms between the different ball pit samples.